Now may be a good time to discuss exactly what I mean when I say “savory quick bread”. Obviously, savory is the opposite (well, basically) of sweet, so there’s that. The term “quick bread” is defined by Merriam-Webster as “bread made with a leavening agent (as baking powder or baking soda) that permits immediate baking of the dough or batter mixture.” Typically, quick breads use chemical leavening; that is, they rise due to chemical reactions that produce gases. They are usually soft-crumbed, and therefore little gluten development is wanted; which means that you, the cook, had better not over-mix that batter, and you’d better move quickly before all those chemical reactions happen. But there are also quick breads that are physically leavened, which means they rise due only to steam expansion, from any and all liquid in the dough. Technically speaking, there are actually three methods for making quick breads: the creaming method, the biscuit method, and the quick-bread method. You may recognize the creaming method from making cakes or cookies – fat and sugar are “creamed” together, then eggs are added, then other liquid flavorings, and lastly the dry ingredients. This method was used in the Poppy Seed Bread recipe last week. The biscuit method involves cutting cold fat into flour, then adding just enough liquid to make it come together. This method is used in scones, pie crusts, and, uh, biscuits. The quick-bread method mixes the wet and dry ingredients separately, then quickly combines the two. This is the method I’ll be focusing on all week, since I figure it’s the strictest interpretation of the term “quick bread”. Not to mention that it’s very easy to find savory breads that use the biscuit method, and nearly (if not completely) impossible for the creaming method, since it really requires sugar. Popovers are an unjustly obscure baked good. Based on a Yorkshire Pudding, and rather similar, they are purely American in origin. They used to be baked with meat drippings rather than butter, which sounds completely awesome to me. Fast, easy, delicious, and impressive, why have they slipped of the culinary radar? Who can say? My best guess is the myth that they must be baked in a very special popover pan. The absolutely tallest popover does require the use of a popover pan, true; but I sure don’t have room for one. They do just fine in my muffin tins, and I dare say are much easier to remove from the pan. If you’ve never had a popover, you’re missing out. Imagine a warm, mushroom-shaped bun. The crispy exterior gives way easily to a nearly hollow inside, webbed a little with a soft, doughy structure. A hint of butter fills your nose and dances over your tongue, if I may be a little twee. I could probably go on and on about popovers. I just love them. Crunchy yet squishy, ethereal yet substantial, simple yet soigné. They’re the perfect balance. The room for variation is nearly unlimited. This recipe uses a lemon-pepper combination that is versatile with a wide range of foods, but is especially good with seafood. I could easily see one of these with the top removed and filled with a good tuna salad. Served with a side of mixed greens, it’s a perfect light, quick, and special lunch! Of course, any minced herb, fresh or dried, would be excellent. Add cloves, cumin, allspice, nutmeg, Creole seasoning, or whatever your favorite spice is! Blend some up: lemon zest with thyme, rosemary with lavender, cayenne with smoked paprika. Go nuts! (Hey, literally… add a tiny bit of finely chopped walnuts or pecans, why not?) You could even add some sugar, and serve them with a fruit salad inside. Grate some cheese into the batter, and serve with tomato soup. You could even tear a plain one in half, spread it with Nutella, and have yourself an ersatz eclair! Oh, good lord. I’m so glad I have some of these left over! 1. Preheat oven to 375°F with rack in lower third. Generously butter 6 cups of a popover pan. 2. Whisk together milk, water, eggs, and zest in a bowl, then whisk in butter. Add flour, salt, and pepper and whisk until batter is combined well but still slightly lumpy. 3. Divide batter among popover cups and sprinkle tops with additional pepper as garnish. Bake until puffed and golden, about 40 minutes. 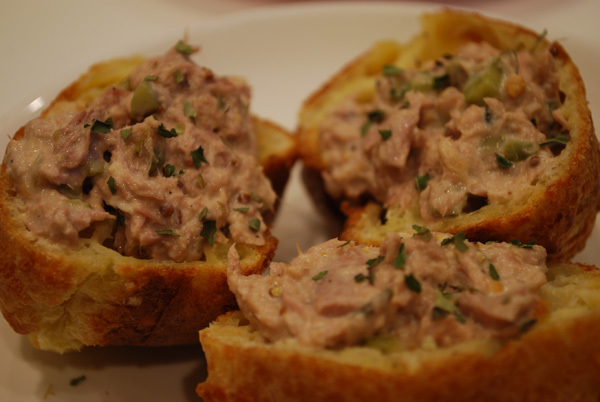 Cut a slit about 1/2-inch long in top of each popover with a small sharp knife, then bake 5 minutes more. 1. 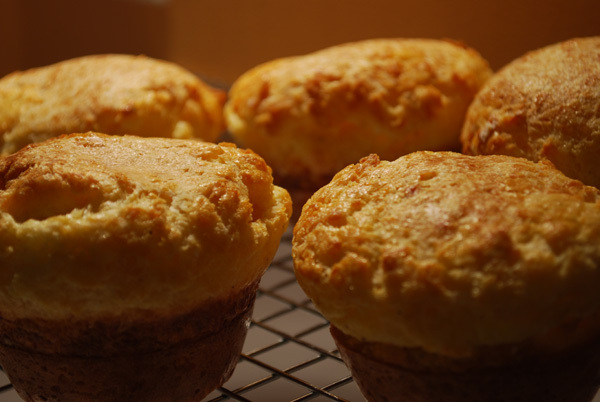 Popovers can be made in 9 buttered (1/2-cup) muffin cups; bake about 30 minutes before cutting slits. 2. For the highest-rising popovers, make sure all your ingredients are at room temperature, and heat your (ungreased) pan in the oven. If you’re really detail-oriented, preheat the oven to 400 degrees, then drop it to 375 when you put the popovers in. 3. I used olive oil instead of butter for greasing the pan, and it turned out just beautifully. 4. I have not tried Alton Brown’s method of blending all the ingredients up together, but his methods have never failed me, and I’m sure it would work just fine with this recipe. A whisk worked just fine for me, but who knows? They may have risen more. 5. Cutting the slits is a very important step! If you don’t, the steam will get trapped inside and make them gummy, and then they’ll deflate; and then you won’t have popovers, you’ll have sad little pancakes. Awww.